In 1987 I had been playing RPGs for less than a year when I met AD&D. At that time it was just the Dungeon Masters Guide, and though I had to spend the best part of my savings to have it, I still don’t know what made me do it. I mean: I had been mostly playing Das Schwarze Auge/The Dark Eye (in its very good Italian translation) and BECMI (actually just B or maybe BE, since the remaining boxes had not yet made their appearance on the Italian market, and I hadn’t yet resolved to get the original English edition), and I considered AD&D a kind of upgrade of Basic D&D; still, I was a bit awed by the all-compassing and complicated rules, which fascinated me but, due to my still lacking knowledge of the English language, were a bit more than I could chew. So I kept on playing BECMI (which eventually became BECM, since I never got the Immortal box), left DSA for MERP and bought both AD&D Players Handbook and Monster Manual; I still had had no chance to test the game in an actual play but I was more and more resolved to correct the situation, and when I eventually managed to convince my friends to have a try, I was already madly in love with the system. In the following years I played many campaigns and, though AD&D wasn’t the only system I used, I managed to burn myself out. At that time my AD&D had got mixed with rules taken from the 2nd edition, and my campaigns were definitely more of the storytelling than the sandbox sort. I was growing uncomfortable with the system and my own playing style, and eventually in the late 90s I quitted playing. 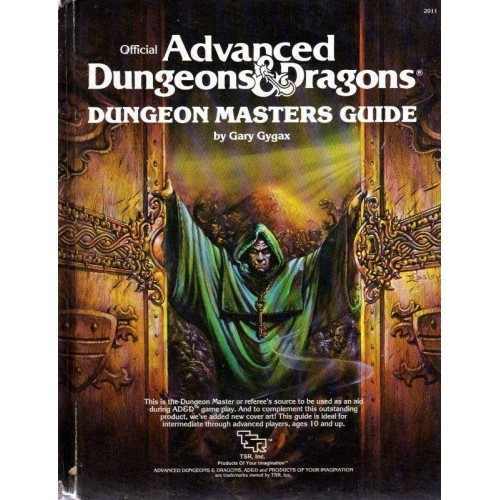 My comeback to the world of roleplaying games is due to D&D 3.0; I played it quite a bit without ever experiencing the same thrill I had felt for AD&D 1st, but I’m not going to indulge in any edition war: after 3.0 came 3.5, and after that Pathfinder (not counting a quick dive into D&D 4). My uneasiness, however, kept growing as the rules became more complicated, and I found myself yearning for a simpler system, but not just that. I still wasn’t happy with my own DMing style. I wanted to give my players more freedom, but I couldn’t: I kept on writing campaigns where the main story had already been decided (by me), and I got frustrated at my inability to have the players freely choose their own course of actions. I tried The Burning Wheel too, and that’s an astounding game, but the rules are not simple enough for my taste and they require very committed players. And then I discovered the Old School Renaissance. It was a true eye-opener for me. Reading Grognardia or The Society of Torch, Pole and Rope (just to name two of the blogs I am currently following) I suddenly understood what I wanted for my campaigns: old school play. So here I am, back to AD&D 1st, to sandboxes and to players’ freedom, and I’m going to stick to the lesson I learned. Storytelling is not for me, though I enjoy playing almost every game system if that means spending an evening with my friends, and whether I’m DMing AD&D, Rolemaster or Runequest (the two latter possibly in their earlier editions) I really can’t conceive anymore playing in a style that is not old school. AD&D is not by far a perfect system: there are many useful rules and many useless ones, but I still prefer it to even simpler games like OD&D, D&D Basic, Labyrinth Lord (even though I’m prepared to adopt any of these if such is the inclination of my players; and, I must confess, LL does exert a kind of fascination over me). If none other, the great D&D family has got one big plus side: you can convert adventures and campaigns (and modules, if you prefer) from one system to another with relative ease. My Fortress campaign, written and insofar played with the AD&D 1st rules, could be very quickly translated for any of the systems above mentioned. This flexibility is a priceless issue for a DM without players, such as I am at the moment! In my next posts I’m going to delve a bit deeper into AD&D 1st rules and to expose my humble thoughts about their usefulness (or lack thereof). Until then, gentle readers, may your steeds be swift and your blades always sharp! Hi mate, same here. 1st Edition AD&D is far better than the later editions and they should of stayed with it. It's good to know that I don't stand alone!